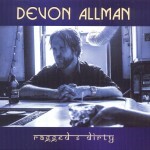 Share the post "Album review: DEVON ALLMAN – Ragged & Dirty"
‘Ragged & Dirty’ takes its inspiration from the late Luther Allison’s funky wah-wah driven title track and provides Devon Allman with his overdue moment in the solo spotlight. It’s a chunky, funky, gritty example of the best elements in Devon’s musical armoury. He’s a feel guitarist and a soulful singer with an eye for accessible arrangements and this album coherently combines all those elements into his best effort yet. He’s spent that last 15 or so years leading his own band Honeytribe, building his profile with the all-star Royal Southern Brotherhood and even guesting on his dad Gregg’s ‘All My Friends’ album. ‘Ragged & Dirty’ is a song driven album as befits producer Tom Hambridge’s involvement, with only 3 songs clocking in at over the 4 minutes. The 12 tracks provide a coherent whole and give Devon the opportunity to recoup his dues. He’s unafraid to tackle covers, from Otis Taylor’s socio-historic ‘10 Million Slaves’ and The Spinners radio friendly, soulful ballad ‘I’ll Be Around’ (beautifully voiced with Wendy Moten), to the Lee Roy Parnell/Hambridge penned ‘Can’t Lose ‘Em All’. And it’s the way he incorporates a variety of material into a melange of soul, blues, old school r&b with Latino touches that makes ‘Ragged & Dirty’ a radio friendly crossover album. He tops the album with a baritone phrased stomp ‘Half the Truth’, on a tale of infidelity, and closes with the gently cushioned ‘Leave the City’. Both songs illustrate the contrast between his intuitive brusque vocal attack and his Gossamer balledic touch. ‘Can’t Loose ‘Em All’ is more of a subtle funky groove. It’s glued together by a dreamy organ line,Devon’s earthy southern phrasing and his piercing guitar tone which is gently delivered over a faintly Latino feel. He takes things way down on the extended, atmospheric instrumental ‘Midnight Lake Michigan’. It’s probably the closest he gets to Royal Southern Brotherhood, on a song with an after hours blues feel, an arc of sultry toned notes, a drifting piano and a sprinkling of percussion. ‘Back to You’ is it’s natural sister track, which benefits from a long, lean, languid bluesy intro and a restrained vocal that flows into the hook. As with his previous ‘Turquoise’ album, it’s Devon’s willingness branch out musically and explore plenty of variety that is the key to a very accessible album. ‘Ragged & Dirty’ has an essential rootsy vibe and a southern rock feel, shot through with the ‘Windy City’ grit of its production.Devon’s baritone voice is retained enough to let the songs breathe, the guitar solos are always an inherent part of the song and the hooks resonate above a succession of grooves, blues and soulful outings. This entry was posted in ALBUM REVIEWS, ALBUM REVIEWS (Mobile), All Posts and tagged album, Devon Allman, Gregg Allman, Honeytribe, Lee Roy Parnell, Otis Taylor, Ragged & Dirty, review, Royal Southern Brotherhood, The Band, The Spinners, Tom Hambridge, Wendy Moten. Bookmark the permalink.